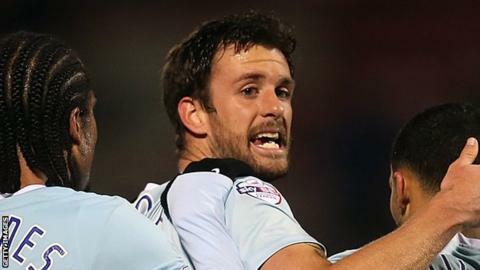 Exeter City defender Dan Seaborne says he would like to extend his stay at St James Park if the club won promotion to League One. The 30-year-old was a free agent until he re-joined City last week on a deal that runs until the end of the season. "If Exeter get back into League One who wouldn't want to sign?" he said. "The club's moving forward each day and who wouldn't want to be a part of that," the former Southampton and Bournemouth player told BBC South West. City are currently fourth in League Two and Seaborne, who last played for Hamilton Academical in Scotland last season, was part of the last Exeter side to be promoted to the third tier back in 2009. Seaborne was brought in after Troy Brown suffered a lengthy knee injury while fellow centre-back Luke Croll is still recovering from a groin problem. And he says the lure of linking up with manager Paul Tisdale and director of football Steve Perryman once again was something he could not turn down. "The same people are still in and around the club now so there's only good things for the club ahead," he added. "That was the thing I came back for, to work for Paul Tisdale again, to work for Steve Perryman. "I got on well with Paul and Steve when I was here before and a lot younger. "Paul's always stayed the same, but it's nice to get in and around him again, but his player management skills and tactics and things like that are definitely what I came back for."